Mirage Sealant & Protectant is an easy to use sealant that produces a tough, long-lasting, brilliant shine never before believed possible. Our formula is wax free for easy application. Mirage contains cross linked polymers that level the surface and seal in the shine to protect the finish from UV rays, air & water borne contaminants for months. Superior to all others for protecting fiberglass, clear coat, acrylics and enamels. 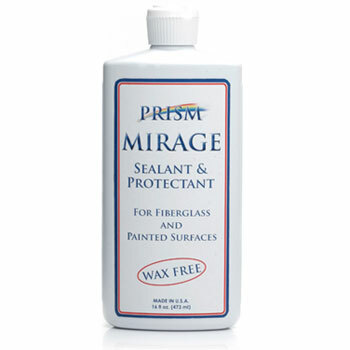 Mirage will keep your fiberglass from oxidizing and your color from fading longer than wax.